Cape Sabine is a land point on Pim Island, off the eastern shores of the Johan Peninsula, Ellesmere Island, in the Smith Sound, Qikiqtaaluk Region, Nunavut, Canada. 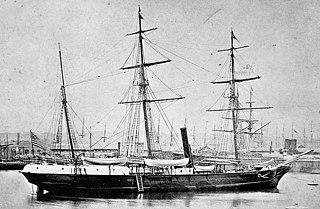 The first USS Thetis was a three-masted, wooden-hulled steam whaler in the United States Navy used to rescue a polar expedition and later in the Revenue Cutter Service. Fort Conger is a former settlement, military fortification, and scientific research post in Qikiqtaaluk, Nunavut, Canada. It was established in 1881 as an Arctic exploration camp, notable as the site of the first major northern polar region scientific expedition, led by Adolphus Greely as part of the US government's contribution to the First International Polar Year. It was later occupied by Robert Peary during some of his Arctic expeditions. In 1991, some of the structures at Fort Conger were designated as Classified Federal Heritage Buildings.